Discussion in 'Accessories, Cables, and Remotes' started by Martin Dew, Jun 5, 2018. 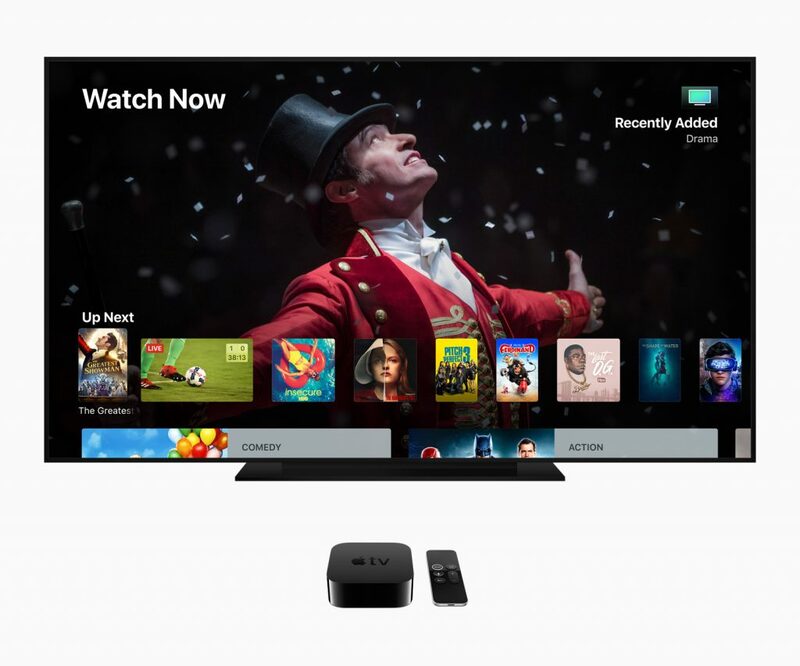 Apple has previewed the tvOS 12 operating system designed for the enjoyment of big screen entertainment, which takes the cinematic experience of Apple TV 4K 'to the next level' by supporting Dolby Atmos immersive audio. Apple TV 4K has been offering what the company claims is the largest collection of 4K HDR movies, and the service includes free 4K HDR upgrades on previously purchased movies in customers' iTunes libraries. From this fall, according to the company, iTunes will also have on board the largest collection of Dolby Atmos-supported movies, and the immersive audio access will be available free-of-charge. With the tvOS 12, Apple TV 4K will be the only streaming player which is both Dolby Vision and Dolby Atmos certified. Apple also announced that Charter Communications, the second largest cable operator in the US, will begin offering Apple TV 4K to its customers. 50 million households are expected to have access to live channels and many thousands of on-demand programs via a new Spectrum TV app on Apple TV 4K, iPhones and iPads, with a seamless integration with Siri and the Apple TV App. Charter Communications will offer iPhone and iPad to customers, and the company joins AT&T's DirecTV Now in the US, CANAL+ in France and Salt in Switzerland, each of which has begun offering Apple TV 4K combined with their services. The plan is to make Apple TV App on iPhone, iPad and Apple TV the single destination to find and watch TV shows and movies from over 100 participating video apps in 10 countries. A single sign-on capability for Apple TV and iOS has allowed users to sign in once to get access to all video apps available through their cable subscription. With tvOS 12, Apple simplifies the authentication process with 'zero sign-on'. Apple TV will detect users' broadband networks and automatically sign them in to all the supported apps they receive through their subscription without the need for typing. Zero sign-on begins with Charter later this year and will expand to other providers over time. Aerial screensavers will continue to be supported and Apple TV users will 'reach new heights' with tvOS 12. Apple, in collaboration with the International Space Station National Lab and the Center for the Advancement of Science in Space, have unveiled new aerials shot from space by NASA astronauts, so Apple TV customers will now have access to scenes shot in 4K HDR. Aerial screensavers will also be more interactive, allowing viewers to see the location information and swipe between a multitude of aerials.